A new website helps visualize evolution. But does it confirm or obfuscate the real world? OneZoom is committed to heightening awareness about the diversity of life on earth, its evolutionary history and the threats of extinction. This website allows you to explore the tree of life in a completely new way: it’s like a map, everything is on one page, all you have to do is zoom in and out. OneZoom also provides free, open source, data visulation tools for science and education, currently focusing on the tree of life. Its fractal-like diagram allows viewers to use their mouse to zoom in and out of branches, twigs and leaves via computer or smartphone. Each branching point is labeled with its evolutionary divergence time on the geologic timescale, and each species is linked to a Wikipedia page. Students will be able to zoom in and see themselves as just one leaf on a branch of primates shared with the great apes, located between rabbits and hedgehogs. As our entry on Visualization in the Baloney Detector shows, visuals can be good or bad depending on how they are used. A picture is worth a thousand words to the human mind. Every good teacher relies on visuals. However, visuals can be used as propaganda tools of indoctrination when they obscure relevant details, distract from solid arguments with eye-catching pictures, or otherwise distort the truth. OneZoom is a perfect example. Understand that creationists and evolutionists recognize our morphological similarities with apes. Both recognize the validity of classification schemes that put rodents in one group, elephants in another group, and generally separate living things into hierarchical categories (kingdom, phylum, order, class, family, genus, species). In fact, the father of taxonomy, Carolus Linnaeus, was a creationist! Of course everyone knows we bear similarities with apes more than with mice; we were all made by the same Creator. The great divide that Darwin fomented is whether all life is related by common ancestry via a mindless, purposeless, aimless process of natural selection acting on random mutations. 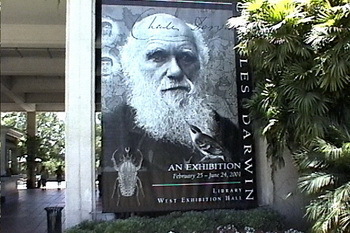 OneZoom will present only the Darwinist world view. Will students be taught about the controversies in almost every branch of this mythical tree? No. Will the designers of the website update it every time a new paper shows a radical revision of thought, which is almost daily? No. Will they be told about the huge unanswered questions, like the distribution of marsupials and the “convergent evolution” of marsupials and their placental look-alikes, that cannot possibly be closely related? No. Will they be told how some of the apparently close twigs cannot possibly be related because they live on opposite sides of the world? No. Will they be told about the major controversies and upheavals about human evolution? No. Will they be told that the origin of life, the base of the tree, is the most puzzling problem of all to evolutionists? No. Will they be told about abrupt appearance of most species? No. Will they be told about living fossils, stasis, or the Cambrian explosion? No! And forget about creationist debaters with PhD’s getting any hearing to point out flaws in this colossal hoaxes-pokes-us scheme, cute as it looks. Darwinism thrives on visualization. Look how the Icons of Evolution survive, despite numerous debunkings by evolutionists as well as creationists. The impossible becomes plausible in Darwinland’s storybook kingdom: life emerges magically from the sea in Disney’s Fantasia, animals magically morph into each other in Carl Sagan’s Cosmos, a theropod runs and takes off as a bird in a BBC documentary on TV. Shameful examples are legion, shamelessly promoted by the Darwin Party in one-sided presentations that present evolution as undisputed fact. Take away their pictures and force them to debate the evidence, and they wimp out. Parting thought: notice how OneZoom will also be a tool of environmentalists. Individual leaves are tailored to point out whether they are “endangered species,” a vexed concept with political overtones. But zoom in on Homo sapiens, and what do you read? “Population status: least concern.” Lesson: the beings that are of most concern to the Creator, so much that He sent His Son to die for them, is of “least concern” to the evolutionists. Think of the consequences of those opposite worldviews. Project: Describe how the information in OneZoom could be recast without the Darwinian “tree of life” motif, showing both the unity and diversity of life without ascribing it to common descent via natural selection. Sketch a diagram and think about how an alternative educational website could display the same information in an attractive but non-evolutionary way. ‘OneZoom is committed to heightening awareness about the diversity of life on earth, its evolutionary history and the threats of extinction. – Is the theory of evolution necessary to talk about diversity and threats of extinction? What’s going on here is an attempt to make a fallacious and largely superfluous theory relevant to current concerns, and to a largely young audience. What we see in the ‘tree of life’ is an expression of Monism. Monist systems have a ‘natural’ tendency to unify all things…. since, at heart, all things are really one. The tree of life is a ‘perfect’ example of monistic thinking. The idea that life had multiple beginnings hasn’t gained much traction in E. thinking as it has an anti-monist feel to it. The idea information is a basic component of the universe (see W. Gitt) has no appeal for the materialist, as it is anti-monist. The materialist is happy with the idea matter and energy are the sole constituents of the universe since they are interchangeable, and thus basically one and the same. Since this isn’t true of information he feels it necessary to reject it as irreducible. i.e. since all is matter in motion all explanation must be restricted to the physical. Explanation (under materialism) is thus required to be monist or monistic, and reductionism is the inescapable result. We see here (OneZoom) evidence of the long flight of Darwinism from text to image. Elite Darwinists are well aware few students have a clue how evolutionary theory is supposed to work, that they find the theory self-contradictory and almost impossible to comprehend, and thus they now prefer to show them evolution in action by bringing theory to life in simple images. These animations hardly reflect living organisms or processes animations accurately, but I guess you could say they’re as close to reality as Darwinism gets.